One of the Southeast’s most vibrant mid-sized cities, Columbia, S.C., was home to the longest total solar eclipse for a metro area on the East Coast and hosted Total Eclipse Weekend Columbia, S.C., a long weekend of more than 120 eclipse-related festivals and events, from Aug. 18 to 21, 2017. Follow @TotalEclipseCAE and #TotalEclipseCAE on Instagram, Twitter and Facebook, and learn more at http://www.totaleclipsecolumbiasc.com. 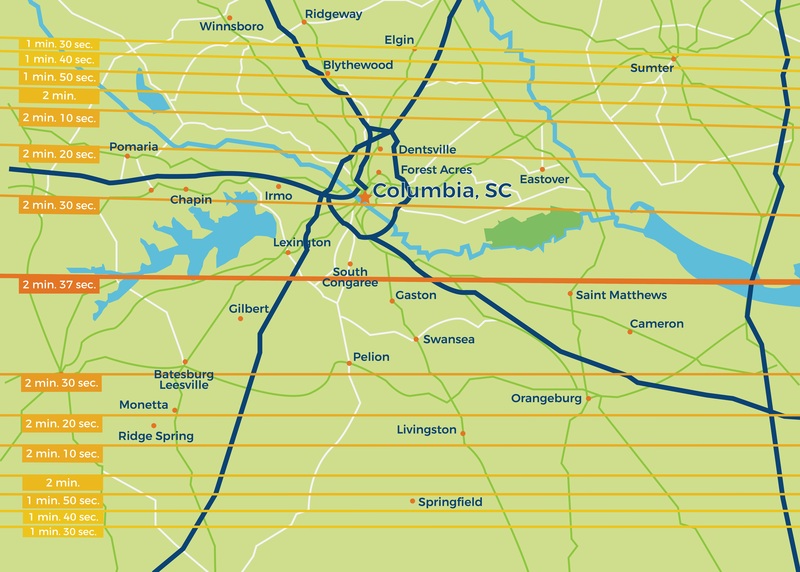 What resulted was unprecedented media exposure for Columbia, S.C., at nearly 60,000,000 estimated press coverage views, and a massive influx of an estimated 400,000 visitors traveling to view the eclipse within the Midlands region Aug. 18-21, 2017. Economic impact in Richland County alone (where Columbia is located) is estimated at $48 million. The S.C. Dept. of Parks, Recreation and Tourism reports that roughly 1.6 million people traveled to or within South Carolina to witness the eclipse in the path of totality. An estimated $269 million in economic impact resulted from the total solar eclipse. More than 50% of the South Carolina State Museum’s eclipse event ticket sales including their sold-out eclipse day event for 3500 guests, were from out of state, came from 28 states and 8 countries, including the UK, Italy, Japan, Sweden, Norway, Hong Kong, Colombia, the Dominican Republic and Canada. Their house tour revenue was 25% higher than normal and their gift shop sales were three times higher than usual due to the eclipse happenings. Tickets for the sold-out Total Eclipse Tailgate at the S.C. State Fair for 14,000 guests came from 32 states including SC, NC, FL, GA, VA, NJ, MD, NY, PN, CN, MA, and DE, as well as Puerto Rico and 3 countries: Canada, Lithuania, and the UK. Tickets for the sold-out Lowcountry Boil and Paella Party at City Roots Urban Farm came from more than 14 states plus Uruguay and Trinidad & Tobago. 32% of runners at Saluda Shoals’ Summer’s End Solar Run 5K were from 11 states outside of S.C. The S.C. Philharmonic sold out 2,160 tickets two months in advance of the concert – a record for the orchestra at the Koger Center and they sold another 300 to their rehearsal the day before. They live streamed the concert into the rooms of patients throughout the Palmetto Health network and their children’s hospital, thanks to support from AFLAC. An estimated 90% of guests at the Lexington County Museum viewing event were from out of state, with guests from 12 states including AL, CA, FL, GA, MD, MI, NJ, NC, PA, TX, VA and Washington DC. Solar Fest West at the Wyman M. “Mac” Rish Riverwalk and Amphitheater hosted around 3,000 guests, collecting a total of 930 zip codes from 17 states and five countries. 100,000 pairs of free glasses, sponsored by the City of Columbia, S.C., were handed out via majority of events on Total Eclipse Weekend Columbia, S.C. site. A limited number were distributed in advance at selected City of Columbia parks, glasses were given to City of Columbia staff and first responders, and a small supply was donated to recruits at Fort Jackson. All of the above were manufactured by NASA-endorsed company Rainbow Symphony in Calif. There are approximately 13,000 units of paid accommodations in the immediate Columbia, S.C. region (comprised of hotels, B&Bs, campsites and year-round vacation rentals across Richland and Lexington Counties). Of these, more than 11,600 units are hotel rooms, spread across more than 120 hotels. 1,624 of those hotel room units are in downtown Columbia, S.C. There are even more rooms if you expand to outer ring counties like Newberry, Saluda, Calhoun, etc. This figure does not include the AirBNB and VRBO rentals that are not normally rented out as vacation rentals, nor does it include home stays, a.k.a. unpaid accommodations. Hotels throughout the Columbia SC region saw an increase in business during the long eclipse weekend, according to STR, Inc., a global leader in hotel data, analytics and marketplace insight. Business was particularly strong on the night of Sunday, August 20. Hotel occupancy was up 135.2% across the region (up 171% downtown) and average revenue per available room was up 380% (up 478% downtown). It is important to note that the reported occupancies and revenues are a reflection of high demand and limited supply. Downtown’s average daily rates during the eclipse weekend aligned with similar rates for special event weekends, such as USC home football games. In the weeks leading up to the eclipse, hotels in the Columbia, S.C., area were at 100% occupancy for Sunday and Monday nights, an estimated 95% for Saturday pm and an estimated 95% for Friday night. Compared with 2016, this reflects a 60% increase on Sunday, Aug. 20, and a 40% increase on Monday, Aug. 21. Newberry, S.C. hotels were reportedly sold out and had been for months. The University of South Carolina pushed its student “move-in day” from Aug. 21 to Aug. 22 to alleviate impact on traffic and lodging. One result is that parents are coming in early and/or staying late to experience the eclipse in Columbia, S.C.
Airbnb planned to have its biggest night ever in SC on Aug. 20, 2017. Airbnb bookings for Aug. 20 were up by 570% compared to the prior week. 40% of Columbia’s 740 Airbnb bookings on Sunday evening were people renting their properties via Airbnb for the first time. Airbnb estimated that it would bring in $2 million across SC for the eclipse, w/9500 bookings statewide on Sunday night. Charleston, S.C. was the U.S. city to receive the 2nd largest guest arrivals overall for the solar eclipse, and according to a pre-eclipse press release from Airbnb, Mt. Pleasant was the 7th, Columbia was the 11th, and Greenville was the 12th. An estimated 1.6 million people traveled to or within South Carolina to witness the eclipse in the path of totality, with an estimated $269 million economic impact statewide. Per the S.C. Department of Parks, Recreation and Tourism, hotel occupancy along the path of totality possibly likely would be doubled compared to what S.C. normally sees in 3rd week in August. There are 47 S.C. State Parks. Usually in the third week of August, roughly 60% of S.C. State Parks’ guests are South Carolinians. In August 2017, only 28% were South Carolinians. According to reservation records, the remaining 72% came from 38 states and several foreign countries. All 28 of the S.C. State Parks within the path of totality were fully booked. Only five S.C. State Parks had availability remaining as of Aug. 15, 2017. Dreher Island State Park, Sesquicentennial State Park, Poinsett State Park are the three S.C. State Parks in or near Columbia, S.C. Dreher Island State Park booked up in June 2017. C. State Parks confirmed an estimated 2,700 reservations for eclipse weekend, totaling 9,000 reservation nights, including cabins, campsites and day use. Includes reservations from across the U.S. and Canada France, Poland and Germany. CAE estimated that arriving flights, normally 80-85% full in August, saw a boost of roughly 15% across the board over eclipse weekend, and departing flights were 100% full on Tues., Aug. 22, 2017. More than 130 private aircraft were planned to fly into CAE for the eclipse weekend. Eagle Aviation hosted more than 100 private aircraft at its eclipse viewing event at CAE. Columbia, S.C. showed the lowest price increase in flights out of seven cities in the path of totality, at 9% (compared to the likes of 29%, 45% and 75% increases in other markets), per Hipmunk. The South Carolina State Museum brought in gross revenue of $437,000 due to the eclipse. Sales on Aug. 20, 2017 at the South Carolina State Museum gift shop totaled $37,000, more than doubling the museum’s previous 30-year record of $17,000 in one day. The museum gift shop’s retail revenue more than tripled as of early August, up 266% from same time last year. At the Columbia Museum of Art, visitation was four-to-five times higher than the average for a summer 2017 weekend, with 55% of visitors coming from outside of South Carolina and confirmed visitation from the following countries: Canada, Germany, China, Italy, Japan, Switzerland, and the United Kingdom. Local small businesses such as Frenzy (local t-shirt company) saw business increase by 15% to 20% or more. California Republic SUP “completely sold out!!!”. They rented out 30 paddleboards and two “MegaSUPs” for a total of 43 people, half of whom came from out of town. Random Tap’s sales at their eclipse day event were 560% higher than normal, with guests from 8 states including NY, CT, MD, FL, VA, GA and NC. Eggs Up Grill on Devine reports a “huge” increase in sales on eclipse day. Henry’s on Devine saw double their normal business on Aug. 20 and 21, 2017. Craft and Draft saw a 20% increase in sales Aug. 17-19, double their normal sales on Aug. 20 and more than triple their normal sales on eclipse day, particularly after the eclipse. “We are EXTREMELY happy with the outcome. We wish there was an eclipse every week!” quotes their management team. Cantina 76 on Main Street saw huge crowds all weekend and was “slammed” Aug. 21 after the eclipse. The Whig bar on Main Street broke sales records on Aug. 20. Good Life Café on Main Street saw an increase in revenue and hosted guests from at least 9 states including NY, Washington D.C., RI, MD, NJ, CT, FL and NC. National broadcast viewership of coverage mentioning the eclipse in Columbia, S.C. is estimated to be greater than 24,676,216, per initial press monitoring reports. Local broadcast viewership of coverage mentioning the eclipse in Columbia, S.C. is estimated to be greater than 23,614,152, per initial press monitoring reports. Multiple national and international news media reported from Columbia, S.C. on eclipse day. Multiple national and international media were on site throughout the Columbia, S.C. region, including ABC News, CNBC News, Channel 4 UK, Denmark’s TV 2 News, CNN Digital, BBC Mundo from the BBC’s Miami office, WHYY radio (Philadelphia’s NPR station), Australia’s Seven News network, Japan’s NHK news network, the Atlanta Braves’ media team, Southern Living, Wired, and even Turkish state news outlet TRT Haber. In addition to remote live interviews w/CTV News Canada, SKY NEWS Europe and NPR’s “Here and Now” radio show, MSNBC picked up the SC State Museum observatory’s live telescope feed during totality (alongside which anchor Craig Melvin talked to him mom on the phone in Columbia during totality), SCETV shared that telescope feed w/PBS and “Nova,” and Weather.com (and therefore Twitter) dipped into WLTX TV’s local coverage. Website sessions at www.totaleclipsecolumbiasc.com increased steadily all summer and spiked to 40,085 on Monday, Aug. 21 after jumping to 33,786 on Aug. 20. (Prior days: 19,969 on Aug. 19; 18,375 on Aug. 18). There were a total of 385,171 website sessions in the last year (Aug. 21, 2016 to Aug. 21, 2017). Top out-of-market referring cities: Charlotte; Atlanta; Raleigh, N.C.; New York City; Washington D.C.
Top out-of-market referring cities between Aug. 21, 2016 and Aug. 21, 2017 in descending order: Charlotte; Atlanta; Raleigh, N.C.; New York City; Washington D.C.; Orlando; Durham, N.C.; Nashville; Augusta; Aiken; Cary, N.C.; Philadelphia; Greensboro, N.C.
39% of sessions between Aug. 21, 2016 and Aug. 21, 2017 referred from the U.S. (378,974), while .35% of web traffic came from Canada (1,353 sessions), .20% from the UK (785), .07% from Germany (255), .05% from India (194) and .05% from Russia (189). Estimated headcount per event was gathered and shared privately in advance with regional law enforcement officials to help them identify potentially congested areas in advance. The Richland County Emergency Management Division reported no issues with exception of expected heavy traffic congestion leaving Columbia after totality. The S.C. Emergency Management Division (SCEMD) did not experience any systemic issues as a result of the total solar eclipse. The S.C. Highway Patrol reports that traffic incidents statewide were actually below normal on Aug. 21, 2017. The Columbia, S.C. region saw an incredible amount of traffic and crowds, but because agencies worked together, our visitors and residents alike were able to plan for themselves to enjoy the full eclipse experience. Columbia, S.C. Tourism Stats, via Experience Columbia, S.C. Direct visitor spending in the Columbia, S.C. region (defined by Experience Columbia, S.C. as Richland & Lexington Counties) in 2016 generated more than $2.1 billion in total business sales including indirect and induced impacts. Nearly 21,000 jobs (6.4% of total regional employment) were sustained by visitors to the Columbia, S.C. region in 2016. Tourism in the Columbia, S.C. region generated nearly $107 million in state and local taxes in 2016. In fiscal year 2015-2016, the Columbia, S.C. region hosted approximately 115 conventions, generating $24.6 million in economic impact from conventions alone. The Columbia, S.C. region saw 14.7 million visitors in 2016, 5.5 million of whom were overnight visitors. From Capital City Lake Murray Country tourism district (defined as Richland, Lexington, Newberry and Saluda counties): Numbers at Lake Murray were anticipated to exceed the lake’s annual July 4th celebrations, which normally have over 120,000 people. The Lake Murray Dam park sites were full to capacity, and Dreher Island State Park sold out of campsites and day use passes in June 2016. 70% of visitors to Riverbanks Zoo & Garden typically come from beyond a 50-mile radius of Columbia. State of South Carolina Tourism Stats via Discover S.C.
Tourism generated a $20.2 billion in economic impact in S.C. in 2015. Tourism supports one in every ten jobs in South Carolina. The total population of S.C. is 4.9 million based on the 2016 census.